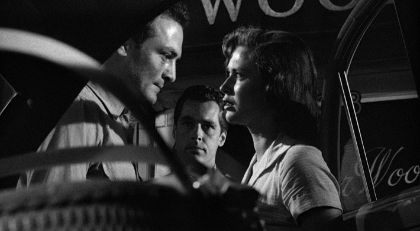 The Garment Jungle is a classic film noir from 1957 mostly directed by Robert Aldrich, who did not get a credit for his work, and was completed by Vincent Sherman. This was also Sherman’s first directing credit in 5 years do to his name being on the gray list. These two films would make an interesting double feature, looking at a similar problem in two different industries on opposite coasts. 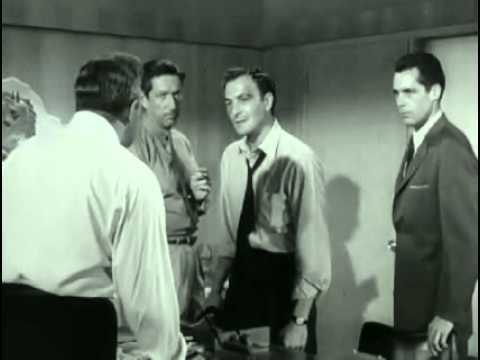 This film starts out with an argument between two partners, Cobb and his partner are discussing what the workers should be paid. Cobb is against the union and his partner is for it. His partner walks away and gets in the elevator. The elevator fails and his partner falls to his death. Cobb’s son, played by Kerwin Mathews, comes back to town and wants to work with his father. When a confrontation between a union organizer, played by Robert Loggia and Cobb happens in front of Mathews on the factory floor, it gets Mathews thinking. Mathews goes to Loggia where he meets the union organizer’s beautiful wife played by Gia Scala. The three work together to break the mob, which is behind trying to keep the company union free and hired by Cobb for protection. The situation escalates and soon turns violent. Will the mob break the union or will the union break the mob? Will Cobb finally look at employees rights or will he continue to support the mob? Who will survive and who will die in this war between the two? Richard Boone plays the mob boss Cobb has partnered with and Wesley Addy plays the head thug for the mob. Both are great in their evil ways. 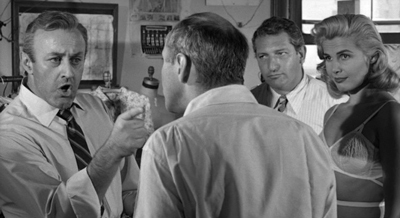 Besides Cobb’s performance, Robert Loggia’s performance is well worth checking out. The dynamic between him and his wife are very interesting. Even though he is a good man trying to do what is right, he has his dark side. I really got a vibe that he beats his wife even though he was madly in love with her. His wife played by Gia Scala is also very good in this. Scala had a short career and looks to have had a hard life with bouts of depression and turned to drugs. This eventually ended her life at a very young age. The Garment Jungle is a good classic film noir worth checking out. It is an interesting time capsule of the union movement in the 1950’s. It is especially interesting to look at the clothing industry then and compare it to how it works now. Many thanks for introducing me to a new film. I just found a nice copy on YouTube and plan to watch it ASAP!